A' Design Award and Competition today launched a new campaign "Valentine’s Day 1+1" in order to share the love for design. 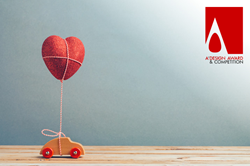 In upcoming days for the celebration of Valentine’s Day A' Design Award and Competition invites designers, architect, photographers and artists to submit projects and be supported by a lovely person. Furthermore, in addition to the exclusive "Valentine’s Day 1+1" campaign, A' Design Award and Competition has also presented another way of celebrating Valentine’s Day for the people who love design. One of the most exquisite gifts for a designer friends and fellows could be the A’ Design Award & Competitions’ Gift Cards. Deadline for entries to A' Design Awards is on February 28, 2016 with results announcement on April 15, 2016. Winners of the International A' Design Awards and Competition will be granted the highly coveted A’ Design Prize that includes a series of PR, marketing and publicity tools together with Design Excellence Certificate, Exclusive Design Award Trophy, Lifetime license to use the A' Pet Supplies and Products for Animals Design Awards Winner Logo, Yearbook of Best Designs, Exhibitions of Awarded Works and Two-Person Invitation to Design Awards’ Gala-Night in Como Lake, Italy.